It was obvious from the first design drawings (in 1999) I made of my “slim” instrument design shown in the pictures below that I would need to devise a way for players who use shoulder rests on their acoustic instruments to use those same shoulder rests with my instrument design. There were some initial prototypes that were not nearly as comfortable as I wished. Still, these early prototypes used some of the design ideas for what I refer to as my “Shoulder Rest Frame”, shown in the pictures below. 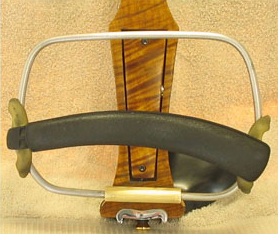 Elsewhere on my site is the prototype that was the precursor of my “Shoulder Rest Frame”. 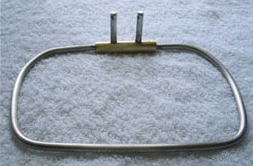 The frame shown below is a 1/4″ steel rod that has been bent to the approximate radii of the lower bout of a full-size acoustic violin. The steel rod is then inserted into 1/2″ diameter brass rod, and then reinforced with 1/16″ steel posts that go through both the steel and the brass. 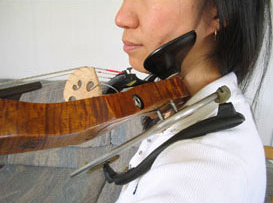 Whether you use a Wolf, Kun, Mach 1, Muko, Viva La Musica or other shoulder rest brand, any of these shoulder rests will easily fit on my “Shoulder Rest Frame”. Without exception, every player who has used it with their favorite shoulder rest has said that it is secure, comfortable and allows virtually any adjustment that is desired. I am a violinist and violist, and have performed for 33 years. I currently perform with the Eugene Symphony, and have played in the Oregon Mozart Players, The Eugene Ballet and Opera Orchestras and The Pfaff Ensemble (a baroque quartet). I have studied violin with Sherry Kloss, an associate of Jascha Heifetz. I also currently play with my acoustic rock band The Sugar Beets, voted Eugene’s Best Band in 1999, 2000 and 2001. 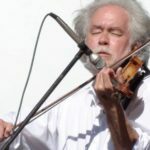 I have, over the last 20 years, played in a number of alternative, original-music groups and am fluent in the jazz, blues, rock, country, celtic, avant garde and world music genres. My interest in making instruments began from a desire to re-create a baroque-era violin. Desire to learn and a love of working with wood, in combination with years of playing experience in symphonies, alternative settings and clubs encouraged me to design an instrument that is comfortable to play, with a sleek yet simple design and, most importantly, made to order by and for the artist – an instrument that is handmade and exquisite. DBCV™ Guarantee: DBCV™ features personalized, individual service. The instrument is handmade to the player’s specifications. The player’s desires regarding type of wood, pegs, string clearance…..everything from hardware on the instrument to the type of final finish is the artist’s choice. I will strive to make the finest, most aesthetically appealing instrument available – an instrument that is at the same time unique, artistically pleasing and comfortable to play.